In the mid of Episode #12 of Hindi TV Serial Shaktimaan we saw that Tamraj Kilbish – The King of Dark Forces and Power – is rising back again. He sees Shaktimaan as the only threat in his way. So he sent his messengers to call all his aides. Episode #13 takes over from here. The puppet messengers – which were sent to convey the call of Tamraj to his disciples – are looking so kiddish. The special effects are very poor in that terms. Mukesh Khanna and his team also served the social responsibility (based on their moral and ethical ideas) to convey the human qualities to the audience. Their main target was the kids, because they are the future. And, the good qualities implanted in one’s mind and heart in the childhood remains forever. This effort or initiative to make the society a better place for everyone is definitely great in itself. Kudos to team Shaktimaan for these genuine efforts. In Episode #13, through a conversation between various kids who are returning from the school; the serial conveys some good points in the same regards. The simple dialogs convey the importance of education. The same group of students found a doll (a messenger of Tamraj) left alone on their way! As we know kids are more curious then the adults and elders. So one of them decided to pick the one. Here also, through the conversation between them, the serial gives another safety message that – one should not pick the strange things which are left alone, no matter how much temptation they create, rather be cautious and inform the adults/authorities about the same. Such presence of mind can prevent some serious mishaps. Apart from one or two kids, most of them are below average actors and we do not found them convincing. We see that Appu runs away with the doll, and it could lead to some serious incidents in his life. But he is intact till we found him visiting the Shaktimaan’s fan club. Here also we see some poor acting as well. Shaktimaan himself visits the club and through his dialogs, we got to hear more good gems. The dialog/script writer deserves the full credit to provide such a good content. Mukesh Khanna is very convincing and excellent as the protagonist. For the role of Tamraj, Surendra Pal’s voice is used, his face is not seen, but he leaves impact with his voice. At the fan club, Shaktimaan not only talks but also play with the kids. This makes the kid’s superhero more adorable. The disciples of Tamraj include the fellows from various professions and include even religious figures as well. One doll which was with Appu, bring him also to the place of Tamraj. We see it is a dark cave where Appu was attacked by vampires. The Vampire scenes are also poor in terms of special effects. Exhausted and frightened Appu, get unconcious in the dark cave due to the appearance of some dark and shady stuff. His friends on the other hand are shocked due to his sudden disappearance. They all ask Shaktimaan to do something to bring Appu back. In Episode #14 we see that the disciples of Tamraj started arriving to the dark cave. There is a scene including the duo Khali-Bali to provide some comic relief, though it is not very effective. They also need to work on their dialog delivery. We also got to see that the duo can be united and become a single person at anytime they wish! They eventually get hold of Appu and cage him. Shaktimaan starts a quest to search for Appu using his Yogic Power. This scene is convincing. 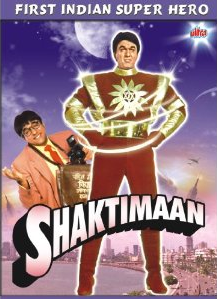 At Tamraj’s place Tamraj found quite frustrated with the existence of someone named – Shaktimaan. He consider him as the only roadblock in his path and he plans the sole mission for his entire army to find the truth about Shaktimaan and overpower him. We see Shaktimaan’s guru visiting the meeting at Tamraj’s place warn him about Shaktimaan. He also answers him that Shaktimaan is one of the Suryanshi who is armed for the battle with Tamraj and his training’s root were up to 6000 years in the past from now. The conversation between Shaktimaan’s Guru and Kilbish (aka Kilvish) is really the gem of this episode. It reinforce one’s trust in the truth. Shaktimaan finally finds the doll and he seems to get a clue to where to find Appu. It will probably lead him to face Tamraj himself for the first time! All dark characters are there together in Kilvish’s cave, where Shaktimaan need to go, will he be able to overpower all them, alone? Both the episode have some poor special effects. Though the special effects applied on the character of Shaktimaan himself are convincing enough. The background sound is the positive attribute for both these episodes. It leaves the impact. The dubbing of Kilbish’ character seems to be done by some other actor (then Surendra Pal) for a few dialogs. Apart from this discontinuity, the dubbing is good. The DVD quality is good. You can trace the story to some of the – Harry Potter – stuff. And in comparison to those movies, which were having millions of USD as budget, you will definitely find the sets, costumes, SFX and other technical aspects as let down attributes. But considering the time when the serial was made, the technology available those days (in the budget they have) it is quite competitive. There some good acting and a lot of poor acting found in these two episodes.